A new BOLD Peach fragrance; no other fragrance but PEACH. Everyone here at Full Moon Candle Co is happy when it's time to pour this one. Really peachy! Peach color. 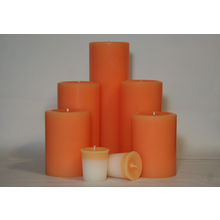 Our 4" Peach burns for approximately 100 hours. Our 6" Peach burns for approximately 200 hours. Our 9" Peach burns for approximately 300 hours. Our Peach votive burns for approximately 15 hours.